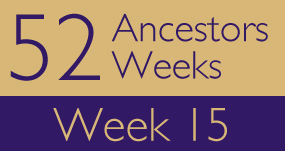 Posted in 52 Ancestors Challenge on April 16, 2014 by Amy Johnson Crow. I wondered if the number of posts would slow down once we got into warmer weather. Then it dawned on me — that might not be an issue! In my neck of the woods, it was 78 degrees on Sunday… and today we had almost an inch of snow. 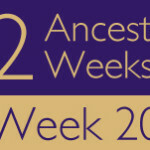 My ancestor this week was William H. Skinner, my 3rd-great-grandfather who had the decency to die in a timely manner. 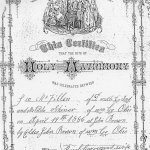 GATLIN – “Henry Cornelius Gatlin” by Beth Gatlin on So Many Ancestors! JOLLETT – “Melinda Jollett Marsh” by Wendy on Jollett Etc. McFADDEN – “Ruth Eileen McFadden (1905-1985)” by Daniel Sample on Where Were They Then? McSHANE – “Bridget McShane, Irish Woman of Property” by Tim Graham on Photo Restorations by Tim G.
OATS – “Thomas John Oats” by Kirsty Gray on Family Wise Ltd.
Hi Amy, I noticed my post #1 didn’t make it on to your list and I wondered if I’ve not done the links right. I’m working from an iPad so that might explain it. I so pleased to be part of this challenge! That was totally my fault! I didn’t have it set up in Feedly. 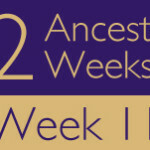 I will be certain to include it in next week’s recap (along with any other 52 Ancestors posts you might do this week). Super! I’ll try and do another this week but I think I’ll miss your cut-off!